As if the constant rush of Apple and Beatles-related product had not been enough so far over the last two months…. It’s available now – exclusively at Record Store Day-participating independent music retailers (and via mail order and digital download from the George Harrison site). It came out yesterday – Friday, November 26, 2010 – exactly forty years on. 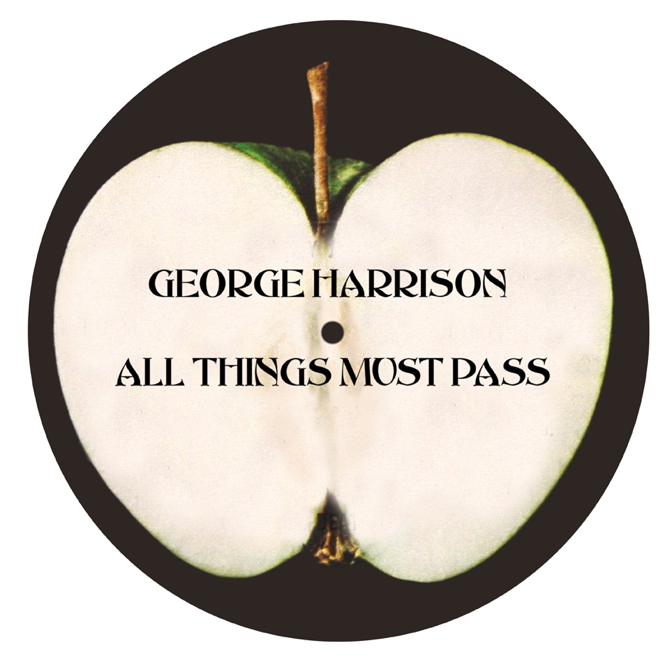 “All Things Must Pass” was originally released on Friday, November 27, 1970. This album is a limited edition, individually numbered, 180-gram vinyl set in its original 3 LP configuration. The faithfully replicated box set has all the original album art, the poster and the inner sleeve packaging. The LPs have been newly remastered at the Abbey Road studios from the original analogue master tapes. The official George Harrison site is offering a free digital download of “Wah Wah”, and there’s a bit of a discussion going at the George Harrison message board. See also Plug In Music. And click here for more on “All Things Must Pass” variations. 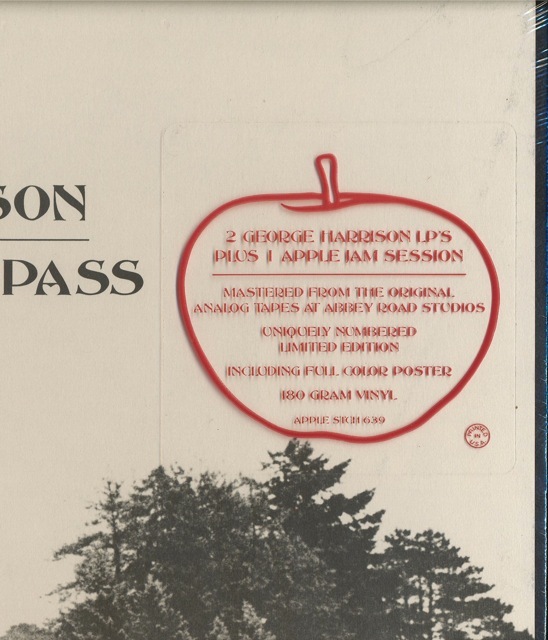 This entry was posted in Apple Records, Beatles Collecting, Beatles Related, George Harrison and tagged All Things Must Pass, Apple Records, Apple Reissues, Beatles Collecting, Beatles Related, George Harrison, Record Store Day, Vinyl box set by beatlesblogger. Bookmark the permalink. What about a 2010 remaster CD version? Thats a really good point! Hadn’t thought of that. If they have recently remastered the album at Abbey Road then a CD version would be terrific. If anyone has any news or info on this let us know. I’m really not sure. If anyone knows or knows how to find out please let us know. I forgot to mention that I picked up the ATMP box yesterday. I have #2765. I purchased my ATMP vinil copy this morning in London. Does anybody know the reason why? The rest is correct; records, poster, red apple sticker on the front. Also, is the record number 07777 98025 17 anywhere on the box or inside contents? If not, it could be that you’ve found an earlier stock copy of ATMP – which if it’s in mint condition is still a really good thing to have! Does it have a place of manufacture anywhere? Thanx for your quickly response! There is a black sticker on the back which it say in small print c.1970 EMI Records Ltd. Manufactured by Capitol Records. LLC. 1750 N.Vine St. Hollywood, California 90028 but without “Record store day” part. Also there’s no record number 07777 98025 17 anywhere. It is manufactured by Apple records inc. 1700 Broadway New York, 10019. At first I thought it was an old one, because it seems touched with dust on the record itself (although it sounds great) but it is new, the 180 gram vinyl, the smell, the box itself, it is completely new. Could you tell me something more? I whish I got a nice copy! Sounds like you have a mint original US copy. I’d still be very happy with it if its such good condition! Wow. Didn’t know that – thanks. That’s really not a lot for the whole world! Wish to clearify, purchased the LP at at Newbury in Boston. Also in stock at Newbury Comics #5200. Hi Tim, Thanks for the additional advice on the numbers pressed for ATMP (2010). I bought number 3344 of ATMP (2010/Apple/Vinyl) at Hogwild Records, Tapes and CD’s in San Antonio, TX. It would be interesting (at least to me) to know if there is any correlation between the serial number and where the record was purchased. If enough people post their number and where they purchased the record, maybe I will construct a map with the numbers on it and post it. That would be cool! Hi. Wow – nice low number. I’ll add you to the list. Cheers. Hi JFK – great idea. If anyone else out there has a limited edition could you please leave a reply with your box number, city, state and country. We’ll try to build up a map of which numbers were sent where. Hi, I pre-ordered my ATMP 40th Anniversary 3LP set from the official George Harrison website, (in November 2010), and was immediately advised that it would ship from the USA. My copy was delivered to me on 14th December – copy number 001984. Sorry, forgot to mention that ATMP 40th Anniversary 3LP box set copy number 001984 was purchased in Cumbria, England, UK. Hi, i got my box today and it was bought from amazon.co.uk but when i look at your pictures, mine is different. Mine doesn’t have a number on the back and the little black label on the back doesn’t have the “Record Store Day” logo on it. It does have the apple sticker on the front though saying “180 gram vinyl” – is this the record store day edition? See the question and comments from Joan above. Seems that it could be in the UK these don’t come with the Record Store Day sticker or the Limited Edition number – but they are newly pressed versions of the LP to celebrate the release date anniversary. Its a bit confusing though. Anyone with any further info welcome. They are at 212 Decatur St. Doylestown, PA 18901. I don’t know where they obtained their inventory though. We’re looking for limited edition serial numbers and where the record was purchased. Any others? Wow. Nice low number on that first copy! Thanks for the information Josh. Anyone else encountered the no Apple sticker issue? Hi, I live in Italy, I have purchased ATMP vinil copy, on the back of my box it is a black sticker on the back that tells clauses c.1970 EMI Records Ltd. Manufactured by Record of Capitol. LLC. 1750 N.Vines San Hollywood, the California 90028 but without “day of shop of Record” the part. There is not also number of record 07777 98025 17 Line. How do I make to know the my number of copy it is which, where can I read it? I am sorry for my bad English, but it thank to all for the help. How do I make to know the my number of copy it is which, where can I read it? Hi Andrea, sorry for the delay in replying. I have been away. 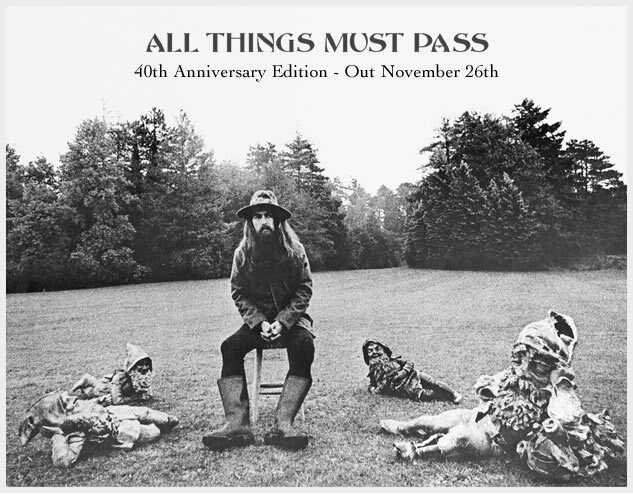 I think that there are many new copies of this 40th anniversary “All Things Must Pass” 3LP set that don’t have the Record Store Day sticker – but they are still part of the new release series anyway. 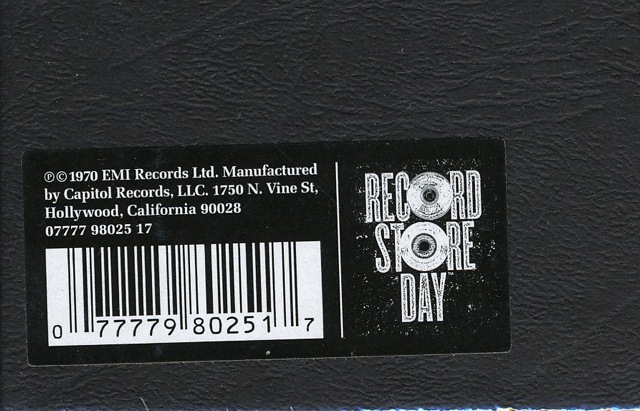 The Record Store Day copies have the limited edition number. 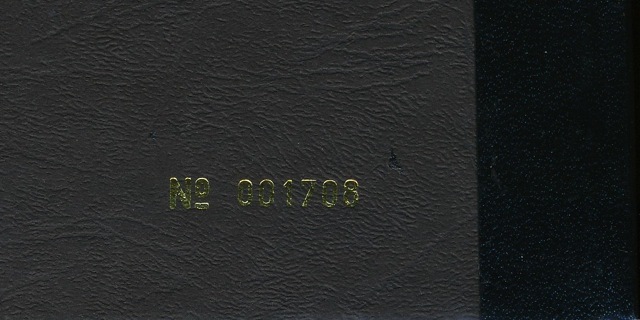 It is stamped in gold on the back of the box, on the bottom right-hand side. Hi, thanks for the answer, therefore the copy of my box is not a limited edition but one of special edition. 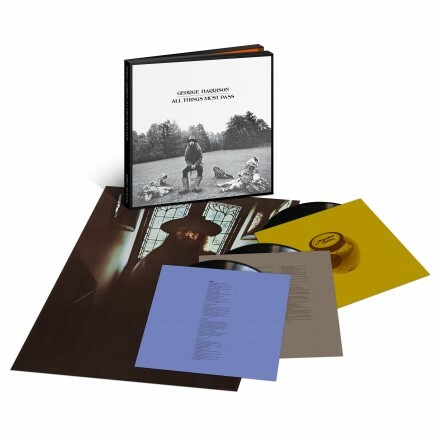 On Amazon.uk it is introduced this way: “All Things Must Pass” [VINYL] [Limited Edition, Box set] and in the photo of the back I see the normal black sticker and no sticker “Day of the Shop of the Record”, Why? Thanks again for your previous answer. Hi Andrey, I’ll update the list. As I know one big Ukranian dealer company (in Kiev) has got several copies of 2010 box with front sticker and no back sticker (Record Store Day) and no limited edition number. As they explained it’s either European or special US-for-Europe (US-for-the-other-world) edition. I think thats right. There are some new 40th anniversary boxes with the limited edition number and there are others that don’t have it but are part of the same release program. We’re looking for limited edition serial numbers and where the record was purchased. Any others? Just drop us a line.